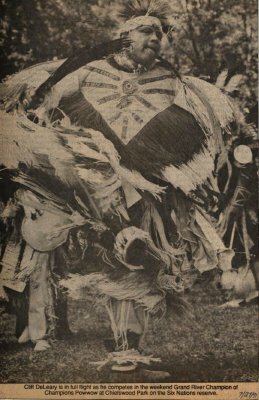 "Cliff DeLeary is in full flight..."
Cliff DeLeary is in full flight as he competes in the weekend Grand River Champion of Champions Powwow at Chiefswood Park on the Six Nations reserve. Sandy Benson Jr. travelled from Curve Lake, Ont., to take part in the Grand River Powwow. Willie St. Cyr of Lac Flambeau, Wis., puts the final touches on his costume before Saturday's powwow competition. Fifteen-month-old Erica Curran of Cambridge reacts enthusiastically to a dancer's performance at the powwow. DeLeary, Cliff ; Benson, Sandy Jr. ; St. Cyr, Willie ; Curran, Erica.